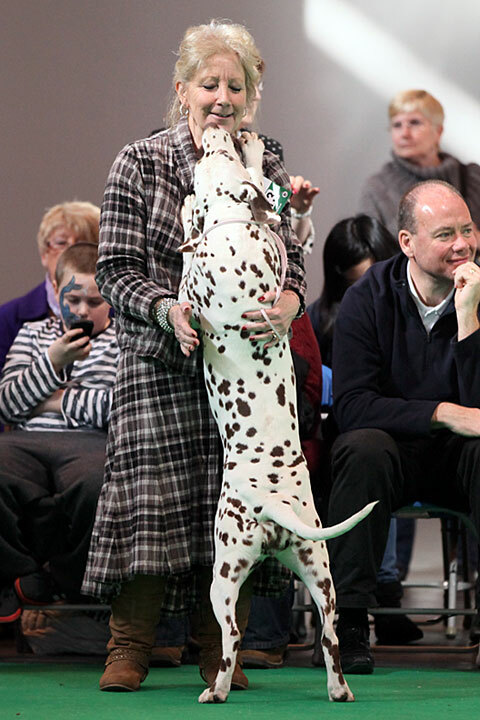 The judge overlooked fabulous Fiona at Crufts today. She wasn't even placed. 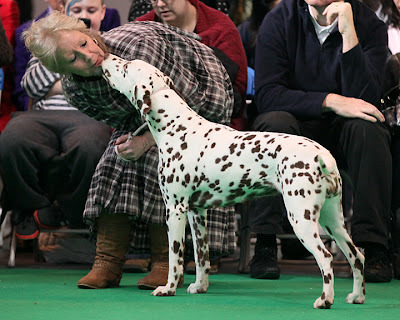 For those that don't know, Fiona is the UK's first LUA Dalmatian - the descendant of an inspired outcross (a Dalmatian to a Pointer) done more than 30 years ago in the US to produce a Dalmatian that has a normal copy of a gene that codes for uric acid. 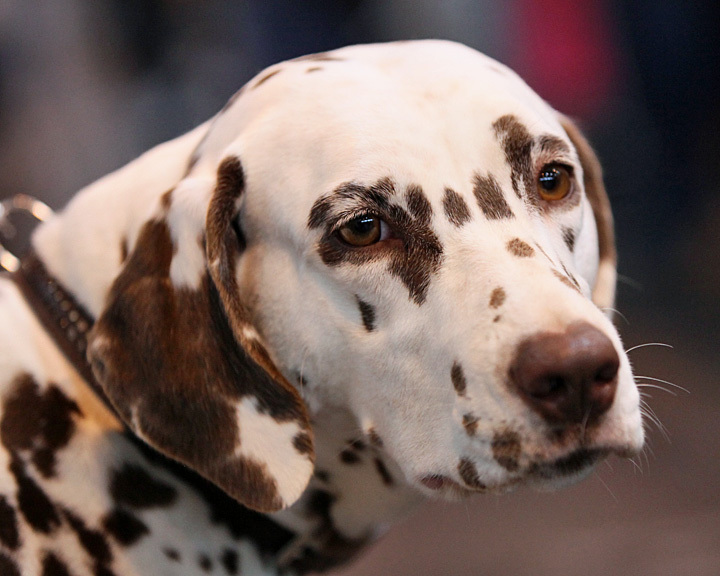 All 'normal' Dalmatians have high uric acid levels that predispose the dogs to what can be a very serious (and occasionally life-threatening) health problem. 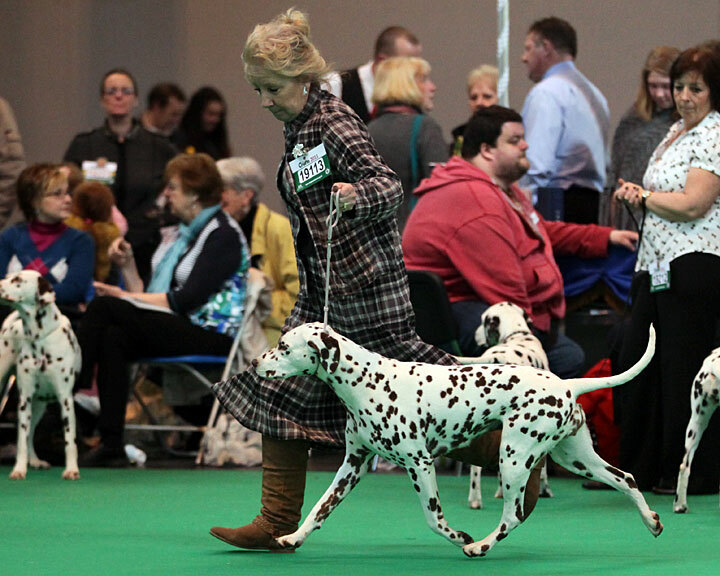 The subsequent breeding programme means that there is now a line of Dalmatians that doesn't suffer from this condition. It has been hugely controversial (at least to the breed purists) and the low-uric-acid Dals are still not registered by the American Kennel Club. The Kennel Club here, under considerable pressure following Pedigree Dogs Exposed and the Bateson Report, did the right thing and accepted her earlier this year - despite breed club opposition. So it doesn't matter that Fiona didn't win. This was her day. That she was at Crufts at all is a real triumph for the breed - even if not everyone recognises it. One fellow exhibitor approached breeder Julie Evans at Crufts and said: "You've done the wrong thing, you know," she said. "Pointers have terrible hip dysplasia." No matter that the outcross was in the 1970s, that there was only ever the one mating to another breed and that there has been no evidence of hip dysplasia in the intervening 14 generations. I don't understand why you are endorsing this new variation on popular sire syndrome. One dog cannot save a breed. Unless this outcross is repeated with a wide range of genetically diverse pointers, relying on one mating 30 years ago is simply spreading the genetic material of one dog throughout the breed. I had the impression you were against that kind of thing? Please take some time to read about the Backcross Project (http://www.luadalmatians.com/). Pretty much the only genetic material to survive from the Pointer today is the normal uric acid gene - in much the same way as the only part of the Corgi in the Bobtail Boxers (also registered by the KC) is the bobtail gene. This outcross was not done for genetic diversity reasons - it was done to fix a genetic problem. That said, enormous care has been taken to minimise inbreeding/maximise genetic diversity in the line. The LUA Dals are probably as diverse as it is possible to get in Dalmatian. Fab Fiona! What a gorgeous girl. Dals aren't my breed, but she looks as correct to me as any of the Dals I've seen in the AKC rings here in the US. how is this anything like PSS? this is quite the opposite actually, PSS condenses the gene pool, the backcross projects diversify the gene pools. I dont breed dogs, I breed rodents, but we do the exact same thing, rather then condensing on a problem line, or elimiating it totally, we introduce an individual from a seperate healthy line to fix the problem and while improving diversity. Oh anonymous, it's nothing like the popular sire effect. There's no need to double, triple, etc. up on this "new" blood. The point is not to concentrate the entire genome of one dog, the point is to introduce one new allele. That's it! There are now tens of generations worth of dogs that can be bred to that have at least one copy of the good allele. You don't even need to double up on that allele, you only need 1 good copy! So while only one outcross was done, none of the dogs in the new line need to become "popular sires" ... you only have to have that outcross in the pedigree anywhere. Only once. No one is asking for anyone to breed every Dal to one dog at all! The more Dals that are bred to this line, the more choices you'll have that are less and less related to the line and less and less related to the Pointer (there's not really that much Pointer DNA other than the desired gene anyway). If you want the good gene, you have probably dozens, if not more, current dogs to breed to. As for Fiona, she's really the only winner there as she'll never know the pain of passing broken glass through her body. Ever thought she didn't get placed cos the judge found others that were far better, it's the way it goes I got some dogs placed yesterday and some that didn't. It's life get over it. Its incredible how little some (I only said some) of these crufts qualifying breeders actually understand or know about dog breeding. A common theme seems to be that because they can selectively put two dogs together to make some puppies makes them huge experts on the subject. Maybe a course in genetics and heritability? I mean, you would expect a dalmatian breeder to understand what a LUA dalmatian is but even the top breeders don't seem to have a clue. "you only need 1 good copy!" Yes! and what about the other 50% of the litter that don't get a copy of the LUA gene? What happens to them? "Pretty much the only genetic material to survive from the Pointer today is the normal uric acid gene"
How do you KNOW that? This is typical of the sweeping unsubstantiated information that is being put about in suport of this. Unless homozygous LUA matings are carried out you have no idea what other genetic information is still there from the pointer. This isnt genetic modification where ONLY one gene is changed. Again, please do your research. There have not been, as far as I'm aware, any uu/uu matings been done, but there have been several Uu/Uu matings done that have produced homozygous UU dogs. No health problems reported so far. Of course, all their spots fell off. The number of homozugous UU Dalmatians produced so far is so small (3 I think but no doubt will be corrected) as to not make any kind of a representative sample for health analysis. "There have not been, as far as I'm aware, any uu/uu matings been done"
We have been doing uu/uu matings for years - that is the usual Dalmatian mating. I think you mean UU/UU. Please get your terms right so as not to confuse. I have only just been pointed in the direction of your page. I have always liked Dals and some years back had considered getting one, but on reading up on the health problems I sadly decided against it. I for one am totally delighted to discover that someone has had the courage to say "enough is enough" and do something to help the dogs themselves. As a moral choice it is a no-brainer to go this route. I have little doubt that in 50 years people will look back in horror on the breeders who argued to knowingly continue breeding dogs that suffer pain. All dog breeders - not just Dalmatian breeders; should think on how a future and more moral society will regard them. Do they get written into history as compassionate forward thinking breeders, or get written into history, as a barbaric person who argued to continue to promote suffering? The choice will be their own, but we can be sure that one day in the future descendants researching their ancestry will either squirm with an uncomfortable feeling that they are descended from a cruel individual or preen with knowing their ancestor was a promoter of ethical thinking. "We have been doing uu/uu matings for years - that is the usual Dalmatian mating. I think you mean UU/UU." You're quite right. The normal uric acid gene is dominant (U) and traditional dals are u/u. "There have not been, as far as I'm aware, any UU/UU matings been done, but there have been several Uu/Uu matings done that have produced homozygous UU dogs. No health problems reported so far." I am shocked people are worried about mud-blood pointers. Have anyone done research on how the British developed the early Dalmatians? Believe me, worrying about pointers is the least of your concern. the anti-Boxer/Corgi people has more reasons to be against such crossing than the people who essentially ignored fact Dalmatians were originally pointers! I applaud Julie Evans for taking a chance on Fiona and for standing up to the breed clubs that opposed her. But, let's remember that sweet Fiona, whatever else she might be, is an experiment. She will have to start producing puppies and Julie (and the rest of us, I hope) will have to see how they turn out in terms of the UU, the "frosty" spotting that people are so scared of, and the myriad other concerns people have. 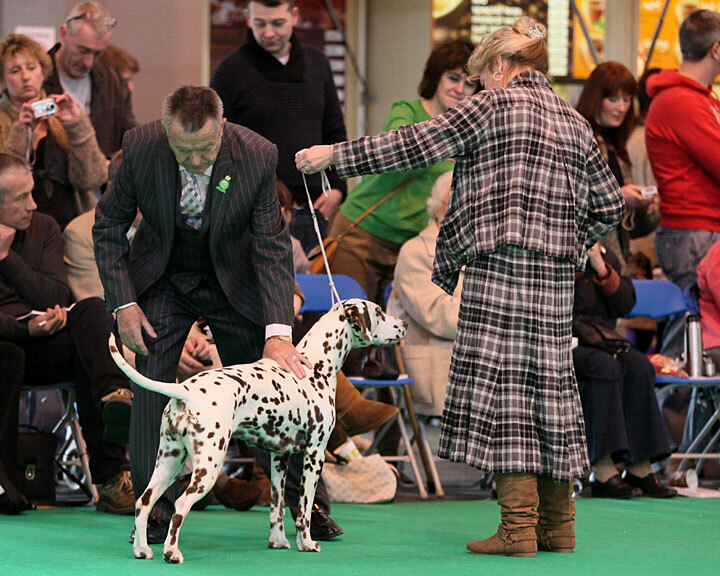 Dalmatian owners and breeders will have to make their own minds up about whether or not they want to breed to or buy a LUA/NUA dog. I don't blame them for "waiting to see". The research is controversial and if you are currently breeding dogs that don't suffer from urate stone formation, then why upset your programme? I'm not saying that's the correct response, but it is understandable. Like I say, Julie is to be admired for taking the longer view. How it will impact the breed remains to be seen. 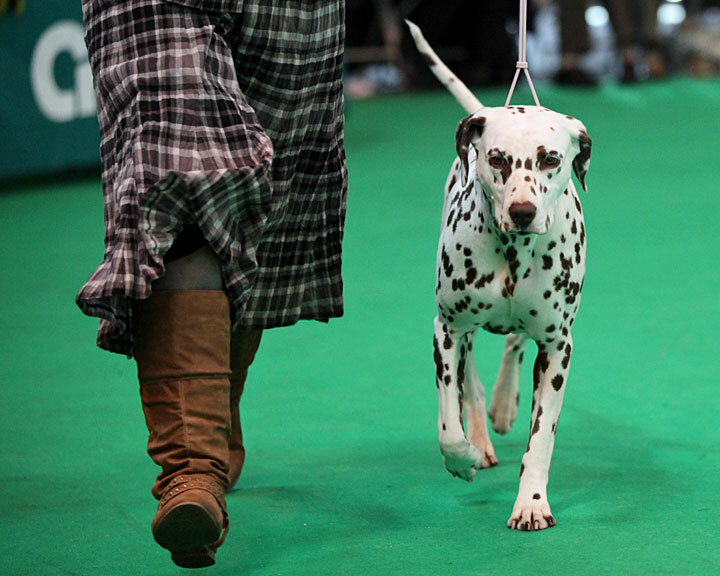 There was a huge entry of dals at this year's Crufts. Fiona is just as good as the rest of them. Most went home without place cards - and so did she. 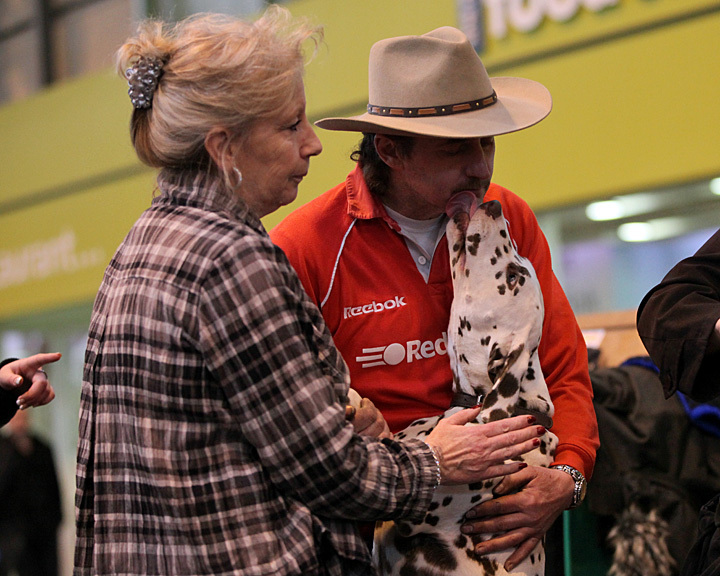 QUOTE : One fellow exhibitor approached breeder Julie Evans at Crufts and said: "You've done the wrong thing, you know," she said. "Pointers have terrible hip dysplasia." The "fellow exhibitor" sounds like an ill informed trouble-maker. There is NO EVIDENCE AT ALL that Pointers as a breed are prone to hip dysplasia. So it is hardly surprising that the intervening 14 generations are HD free. As with Anonymous posting 14 March 2011 12:01, I too love the Dalmatian, but hate the health problems associated with the breed, and would never have considered taking one of these dogs on before now. Let us hope this line of LUA Dalmatians is continued and becomes the norm for the breed as a whole. by the looks of the front and side movement of that dog and the way it toes in, not to mention that is far to fat, is it any wonder the judge would of thrown it out. Againthis blog get so much wrong and try to balme others for is own mistakes and misdirection!!! She does not look overweight at all. Not NEARLY as labradors are nowadays. She is not trying to "balme" anyone, only make dogs healthier. Actually this is not true! She may not ever form urate stones but she can still form struvite stones...just like any other dog. She is a very pretty dal and she looks very relaxed and happy! I was glad to see that she was judged along side the other dals and even happier to see that the judge made his decision based on which dal fit the standard the best on that day. From what I can tell by these photos (and others that have been posted on the net) there is a much different "type" in the UK than what we see out here in the rings of the U.S. It looks like Fiona fits right in over there! I'm sure she has much more winning to do! Fiona IS a winner! What strength and courage her owners/breeders have shown! Fiona is an excellent representative of the breed. Kudos to all who have helped with this project. I look forward to what Low Uric Acid can bring to this breed. For those worried about what happens when the Pointer shows up twice in a pedigree--look at Fiona. There was a LUA x LUA mating in her background. No frosted spots or hip problems (she has the X-rays to prove it). The chances of a slew of unexpected genes rushing forward because of a dog appearing twice 13-15 generations back are astronomically small. The U gene is there because breeders test for it. 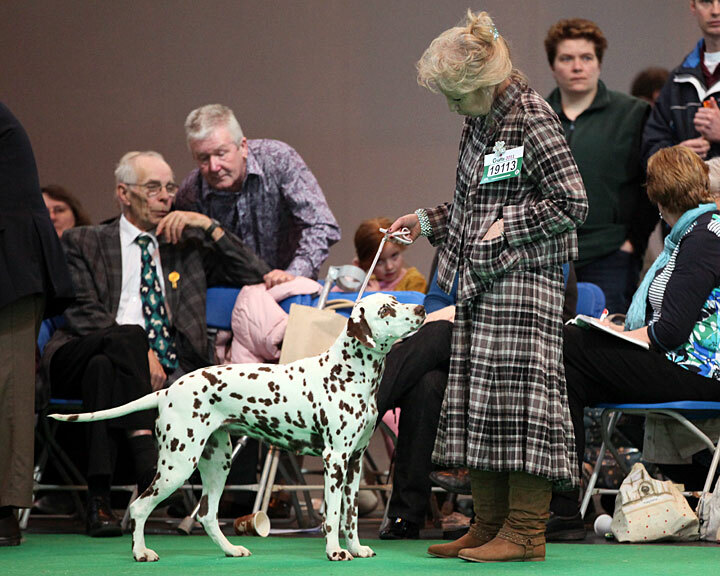 You can't double up on the Pointer 15 generations back without also doubling up on the 32,766 Dalmatians also in that 15th generation. There are only about 19,000 genes in a dog, BTW. At least a third of those dogs will have no genetic representation in the pups as it is! Beth F, yes I do know, and I don't personally disagree about the spotting. But it is an issue in the UK and not something that people see as a viable "trade-off". If all dogs carry the u gene, but not all dogs are prone to disease, why would you compromise on spotting? That seems to me to be the crux of the argument, today. It doesn't matter what is going on in other countries. We are an island nation and reserve the right to make our own mistakes! If Fiona can make a positive contribution to the breed in the UK (i.e. getting healthy puppies into the mix)- and I sisncerely hope that she will - then I am sure we will see a change in attitude. Just because you live in the UK doesn't mean you don't import foreign dogs, compete with foreign dogs, have foreign judges come to your competitions or even have a say in what a breed from Croatia should look like. If several other countries decide that the spots are not as important as the health of the dogs then this country should also comply. Since breeding dogs is essentially an international deal with several other countries and you NEED the imports and foreign contacts, you do not have the right to go nuts with your mistakes and think it'll be fine and dandy. And you especially do NOT have the ethical right to let your dogs be at high risk for a painful disease just because it is "supposed to" have certain spots. I will never ever understand how someone can believe that an esthetic feature is of higher value than health. Do you even see your words? 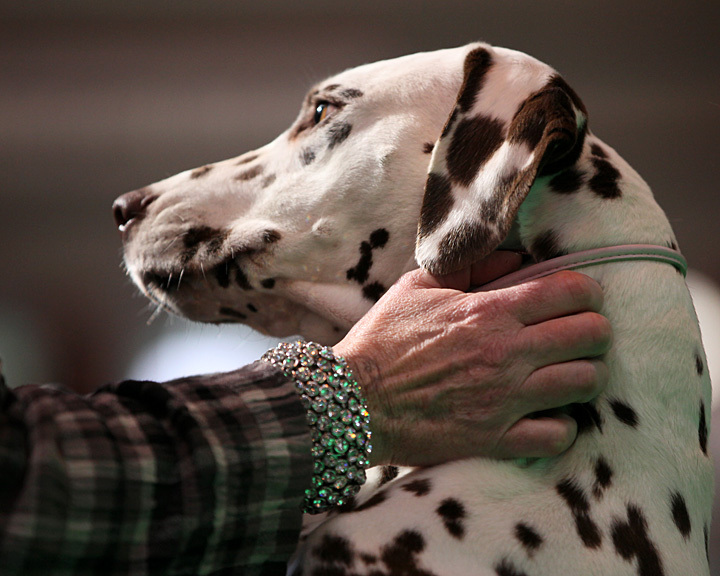 "Just like any other dog" Its a very LARGE percentage of urate stones that Dalmatians produce. And that percentage does not even come close to the amount of Dalmatian owners where the dog was back flushed and the actual stone never sent to the lab for analysis. So, Yes, LUAs are "just like any other dog" in that they "could" develop other types of stones. It seems to me the breeders opposed to the use of LUAs in breeding programs, and opposed to showing them in the show ring are worried about the spotting rather than the actual health of the dog. While nothing is a sure fire fix for the stone/crystal problem in Dalmatians, having low uric acid eliminates the configuration of urate stones. Fiona has proven she can stack up with the best of them in the show ring. Lets face it, no dog wins 100% of the time. Kudos for Julie for standing up for what she believes and moving forward with it. Those of you that do not want to include these dogs in your breeding program, you don't have to. Why do you only put up negative comments from "fellow exhibitors" I show Dalmatians, only started fairly recently and have made comments on Champdogs and around the ring at Crufts that were positive but no-one want to hear them because that wouldn't be a story would it?????? 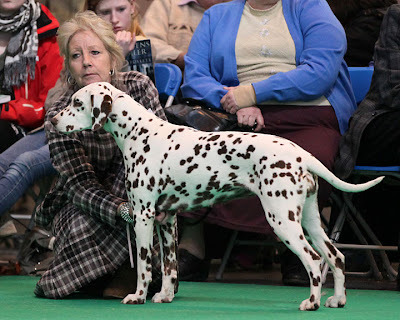 Not all Dalmatians that are u/u live agonizing miserable lives, they don't all form stones, they just have the potential to. We are not all against this project but some do feel that it has been rushed through by KC because of pressure brought on by PDE, why has America not agreed to register these Dalmatians? Hope something doesn't go terribly wrong, and the "experts" have had time to think this through. I have absolutely no problem with outcrossing to a similar breed in order to solve a health problem when you have bred yourself into a corner. However, if this experiment was continued to it's logical conclusion and every single dalmatian in the world was now descended from the original pointer/dalmatian outcross, only 50% would be Low Uric Acid dalmatians (Uu). Having sacrificed genetic diversity throughout the breed, the result would still be a 15% incidence of urate stones (30% of the uu dogs as is true at the moment). If outcrossing is to be the solution, you have to outcross to several genetically diverse dogs so that you can then create dalmatians that are homozygous for the desired gene (UU). These will then pass on the low uric acid gene (U) to all their offspring. By careful testing you can gradually eliminate the uu dogs and eventually the Uu dogs from the breeding programme without completely destroying the genetic diversity of the breed. There are, I believe, several UU dogs in the world now. When these are of breeding age and produce all low uric acid offspring, those numbers are bound to increase. I know there are people reading this that know how many exactly there are. 5? or 7? The relevant CHD figures are, of course, the US figures, since that is where the backcross took place. The rate in Dalmatians is 4.6% dysplastic, with 10.2% showing "Excellent" hip structure per radiograph. These are both very low numbers, as medium-large dogs go. Both gene pools have very sound hips, relatively speaking. I'd gnaw off my arm to have numbers like that in my breed. In any event, the approach to outcrossing when the "donor" breed has a higher load for a polygenic trait than the "recipient" breed is pretty simple -- choose a "donor" dog who has a low genetic load for that trait. Now I'm sure that practically no one was radiographing pointers and Dalmatians back in the 70's. (When CHD was a "German shepherd disease" if acknowledged at all.) If the Backcross Dals maintain a rate of radiographic dysplasia no higher than the breed norm -- assuming no-worse-than-average selection practices for hip conformation -- then I think we can dismiss the terrible sturm und drang over the foreign contamination of the pelvis, no? If I was repeating this experiment today -- and I would in a heartbeat -- I'd simply choose a pointer stud with excellent hips, from a line with excellent and good hips, and a proven producer of excellent and good hips. The breed average means nothing, the individual dog's genetic load means everything. But that is the problem, isn't it? The curious notion that "breed" is the same thing as "brand." That animals are products that should be uniform, rather than biological beings, expressions of Nature in all Her messiness. This is not a contribution to the discussion - but Heather, you´re just lovely. Your "dragyoursorryassoutoftherubble" piece on GSD conformation made me laugh out loud. When I quoted in on my blog, there were responses like "Right on Heather!" Thanks again for saying the obvious again. You´re brilliant. Why aren´t there more people like you speaking up? THERE US NO SUCH BREED AS AN ENGLISH POINTER!!!!!!!!!!!!!! Short name pointer, long name ENGLISH pointer. Who ever said that Pointers (AKA English Pointers) suffer or a prone to HD in any way are just talking out of the thing they sit on. There is absolutely no HD issue in Pointers and they obviously make this comment based on a total lack of understanding or fact about the breed. Some people really should just shut right up. Even after 15 generations there are very few LUA Dals to use. They do not uniformly produce LUA in their litters, there are HUA pups too. Furthermore the backcross project went off the rails and nearly died out so not a lot of dogs produced so the genetic diversity claim for LUA Dals is doubtful given the bottle-necking. There is no plan on how to use these few handfuls of dogs in the breed without skewing the genepool in the direction of LUA backcross (Pointer x Dal crossbreeding). It's no different than a popular sire effect. Stones are not a widespread problem, a small number of male Dals form stones. The Dal club in the US is doing a study on why some males develop stones and their litttermates do not. The Dal breeders are wise to look at this carefully. BTW, Fiona over-reaches based on the movement shot on this page. I would not call that moving like a dream.